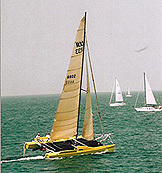 FinCo's affiliate, The Foss Company, helped develop the rudder components for the revolutionary Reynolds 33, the world’s fastest production catamaran. This project began when Randy Reynolds, owner of the Reynolds Sailing firm, came to FinCo and Foss with a set of prefabricated patternss for the R33’s prototype rudders and dagger boards. Randy and his design engineers wanted these crucial components to be created from composite materials using the latest in cutting-edge fiberglass lamination technology. Our craftsmen used the patterns to create molds for the first generation of rudders and dagger boards for the sleek, 33-foot catamaran. Following the initial sea trials, FinCo and Foss worked closely with Reynolds Sailing to improve the lamination and bonding process for the prototype rudders and dagger boards. Our staff also helped analyze the prototypes, redesign some of their components, and reconstruct the components using carbon fiber, engineered core foam, and an epoxy bonding process. Today, all new R33 catamarans come equipped with ultra-strong rudders and dagger boards produced by FinCo and The Foss Company.